The 2018 Wine Challenge was held at Winding Wood Vineyard on Sunday September 2nd 2018. 32 wines from 12 vineyards were entered from the Region. The four judges led by Patricia Stefanowicz MW commented that the quality of the wines this year was exceptionally good, as can be seen by the number of Gold medals awarded, especially in the sparkling wine class. Class 1: Dry White, 2017 – 7 entries; Class 2: Dry White, prior to 2016- 5 entries; Class 3: White, not dry, any year – 0 entries; Class 4: Red, any year – 1 entry; Class 5: Rose, any year – 3 entries; Class 6: Sparkling, any year, any colour – 16 entries. You can download the results brief here. Bothy Vineyard, Oxfordshire’s oldest vineyard-winery is 40 years this year – and we will be toasting our rich history with a delicious glass of sparkling wine this Saturday 2nd June during a day-long Open Day. Members of the public will have a rare opportunity to visit Bothy Vineyard on Saturday when the vineyard grounds will be open and at its most beautiful. The pink tinged vine buds will be unfurling and the wildflower meadows will be in full bloom. Visitors will be able to wander in between Oxfordshire’s oldest vines and paths decorated with sculptures too. They will be treated to free tutored tastings of Bothy wines, with nibbles and birthday cake. and meet the producers. 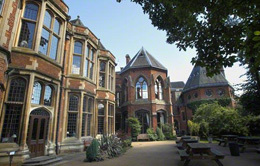 Two free tours are scheduled (12 and 3 pm) to give the visitors a chance to learn more about the UK wine industry. There are several reasons for celebration. Besides turning 40, Bothy Vineyard has just successfully bottling its 2017 Vintage. After several years of being hit by late frosts, the vines came through this cold winter and spring with virtually no frost damage. The mood is optimistic. This event is part of English Wine Week and the first of Bothy Vineyard’s 40th birthday celebrations. The full press release and news of other events at Bothy Vineyard can be downloaded here. The 2017 Wine Challenge was held at Stanlake Park Wine estate on Sunday September 3rd 2017. 44 wines from 15 vineyards were entered from the Region. The five judges led by Patricia Stefanowicz MW commented that the quality of the wines overall was very good, especially the sparkling wines. Class 1: Dry White, 2016 – 9 entries; Class 2: Dry White, prior to 2016- 13 entries; Class 3: White, not dry, any year – 0 entries; Class 4: Red, any year – 3 entries; Class 5: Rose, any year – 5 entries; Class 6: Sparkling, any year, any colour – 14 entries. 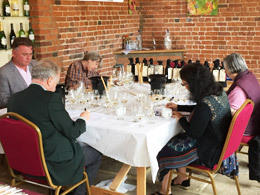 Class 1: Dry White, 2014 – 12 entries; Class 2: Dry White, prior to 2013- 9 entries; Class 3: White, not dry, any year – 0 entries; Class 4: Red, any year – 4 entries; Class 5: Rose, any year – 7 entries; Class 6: Sparkling, any year, any colour – 14 entries. Another scoop of medals for Alder Ridge Vineyard as they pick up Gold and Silver at The Champagne and Sparkling Wine World Championship! Alder Ridge Vineyard, based at Cobbs Farm in West Berkshire was established in 2011. Nestled into the Kennet Valley on southerly facing and chalky slopes, there was no question about planting the classic Champagne style grapes; including Pinot Noir, Chardonnay and more recently Pinot Precoce and Pinout Meunier. The attention given to these vines borders on the obsessive but what has been proven, is the ability to produce world class English Sparkling Wines as they pick up yet more awards 20 months after releasing their first vintage. 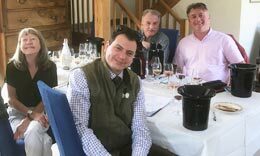 In 2016, their 2013 Blanc de Noirs beat some of the bigger French Champagne houses (such as Taittinger and Veuve Clicquot) in blind tastings at the International Wine Challenge where they were awarded a Silver and later in the year a very respectable Gold at the English & Welsh Wine Awards. This latest haul, from the prestigious Champagne and Sparkling Wine World Championships 2017, saw their 2013 Blanc de Noirs awarded Gold and their recently released 2013 Classic Cuvée a Silver medal. These awards pull together the very best in class of Champagne and sparkling wine from all over the world, with only 127 Gold medals and 167 Silver medals being awarded internationally. The full press release can be downloaded here. The 2016 Annual General Meeting was held at Cherwell Boathouse on Sunday 10th April. 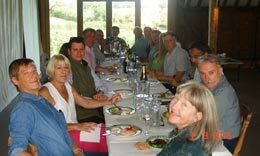 The AGM was followed by a tasting of the winning wines from the 2015 Annual Wine Challenge, the presentation of Trophies and certificates and rounded off by a delicious 3-course lunch. 16 members attended the meeting. We were joined by Barry Lewis, the new CEO of the UKVA who presented the main changes to the UKVA management structure and highlighted the main focus areas for immediate action. You can download the 2016 AGM minutes here. Four trophies were presented at the meeting (see photos). 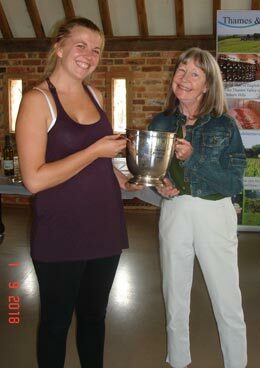 Mike Dean of Vernon Lodge was unable to make the meeting to collect the Anne Howitt Salver for best non-Commercial Wine. It is with great sadness that we learned of the death of John Petersen on March 29th 2016 following a 4-year battle with multiple myeloma. John was a very active member of the T&CVA and always participated in our events. He will be sadly missed. 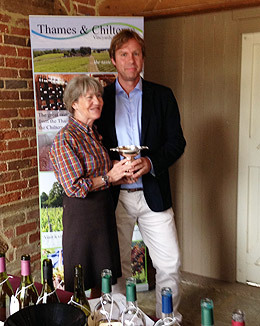 The Stefanowicz salver for the Best Rose wine 2015 was awarded posthumously to John and will be given to his widow, Feona, who intends to carry on John’s good work in the vineyard. 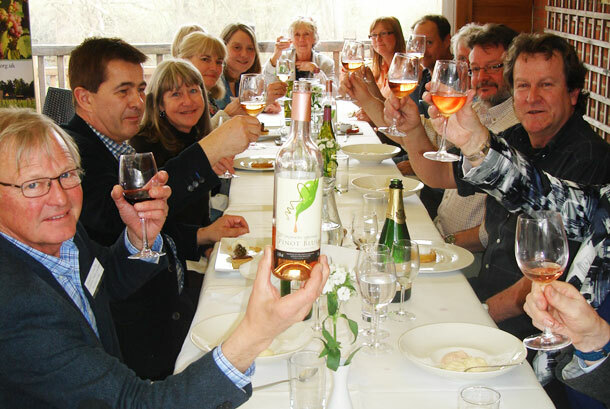 Members of the T&CVA gave a toast to John’s memory with a glass of his award winning Rose wine, at the AGM. Berkshire’s Most Westerly Vineyard Launches First Home-Grown Sparkling Wine! Alder Ridge Vineyard, planted at Cobbs in 2010 and consisting of classic Champagne variety grapes Chardonnay and Pinot Noir, has now produced its very first 2013 Vintage Blanc de Noirs Brut, available from mid-November. With terroir demonstrating many of the chalky characteristics of the traditional Champagne region, we believe this first vintage, with its exceptional provenance, shows the true potential of English Sparkling Wine and its bright future. As Berkshire’s most Westerly vineyard, based at the much loved Cobbs Farm Shop & Kitchen, we continue to invest in this exciting new development by planting another 3 acres of Pinot Meunier and Pinot Précoce grapes in 2015. These additional classic Champagne grape varieties will allow us to further develop and enhance the flavour profiles of future Vintage releases to showcase Quality English Sparkling Wine at its best! 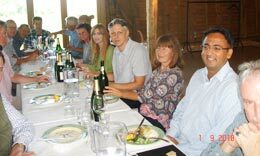 Alder Ridge Vineyard is based at Cobbs Farm Shop & Kitchen, just outside Hungerford on the A4. Cobbs specialises in promoting and supporting local and regional food producers as well as other artisanal and niche businesses. The site boasts a delicatessen, fresh butchery counter, fishmonger, florist, licensed café and bespoke indoor play barn. www.cobbsfarmshops.co.uk. Read the 'Emma Rice waves her wand across another sparkling triumph' article in Glass of Bubbly. Stephen and Fiona Duckett have planted 61,000 vines already at their new vineyard near Pishill, and are planning to produce top quality sparkling English Wine. We warmly welcome them to the T&CVA and wish them great success with their vineyard. Download and read the full story here as reported in the Henley Standard. Wine Growing in Great Britain is a complete guide to establishing a vineyard in the UK and other cool climates and includes a chapter on the finances of grapegrowing, winemaking and sales. It includes a chapter on Vine Varieties, Clones and Rootstocks which is also published as a separate book. 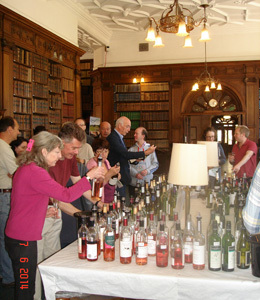 200 people attended the English Wine Festival at the Oxford Union in Oxford on June 7th 2014 where members of the public were able to taste almost 200 Award-Winning English & Welsh Wines from the UKVA National Wine Competition 2014 held over the previous two days at Balliol College, Oxford. National Wine Competition – the heat is on! 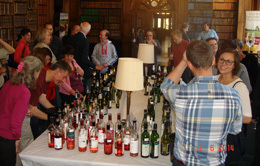 English Wine Festival 2011 a huge success! 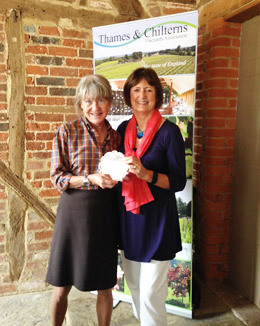 Around 600 people flocked to Stanlake Park vineyard over the weekend of 23rd/24th July 2011 for our English Wine Festival. You can download more details of the event here.